SNES Prince of Persia 2 (USA) in 11:00.42 by nitsuja. 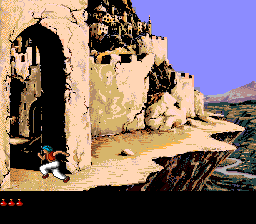 Prince of Persia 2 is one of the most challenging games ever made. Maybe this is because of the terribly imprecise control, the nonsensical puzzles, and the character's amazing inability to survive falling any distance. There are no pits with spikes this time around, apparently there were enough complaints about the ones in the original Prince of Persia, but unfortunately, non-spiky pits are just as deadly as spiky ones, and the new traps are far more sinister.